This home will be your own Private Beach Castle & boasts lovely decor, a layout that provides spectacular Ocean Views from two of the bedrooms & the main living area. Located just 1.5 miles from the Wright Memorial Bridge, enjoy the cool breezes from one of the two large sun decks. It is also a great place to relax & enjoy watching the Moon Rise over the ocean, marvel at the beautiful star lit sky, or witness the sunrise & watch the surf roll in. This home is nicely furnished & well equipped to ensure a great vacation. A great place to create a memorable family vacation or a romantic get-a-way, "Sea Breeze II" is an outstanding vacation destination. The oceanside deck is gated for safety & two mature dogs of a small breed are allowed. The home is conveniently located within walking distance to area shopping & excellent dining. Ground Level: Parking for 5 Cars, Steps to Entry, Enclosed Outside Shower, & Park Grill. 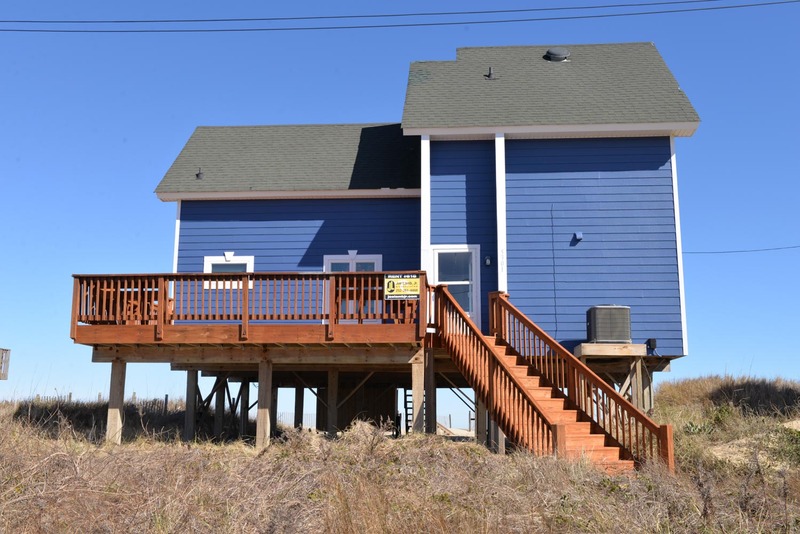 Mid Level: Warm & Cozy Living/Dining/Kitchen Area w/50 Inch Plasma HDTV, Netflix, VCR, DVD, Stereo, 1 Bedroom w/2 Queens & TV, Full Bath, Laundry Area, Large Front Sun Deck w/Deck Furniture, & Large Oceanfront Sun Deck w/Deck Furniture (approx. 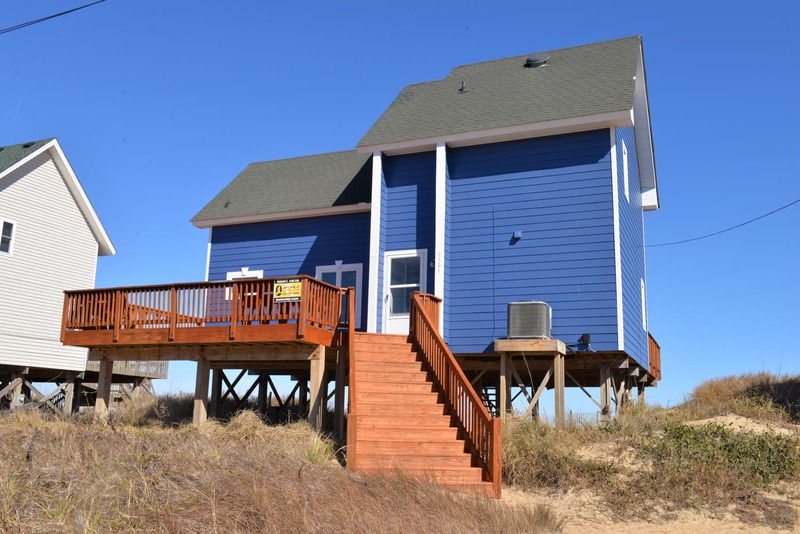 12 x 40 ft.), Steps to Beach, & Outstanding Ocean Views. Features include: C/AC & Heat, Dishwasher, Microwave, Wireless Internet, Phone, 5 TVs, VCR, & DVD. Located Next to #381 & in Close Proximity of #383, 385, & 387 for Large Family Gatherings. Windows do Not Open. Two Mature Dogs Allowed w/Fees. This is a Non-Smoking Unit. 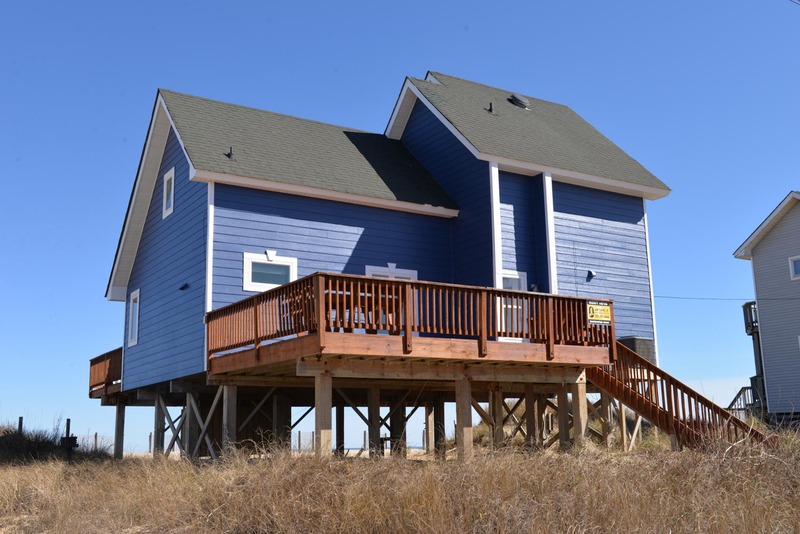 This home is truly welcoming in genuine Outer Banks style. The care put into the home is evident, and provided a comfortable setting for relaxing and enjoying friends for our girls weekend. The finishes were very nicely done, and the home was well-appointed. Beautiful kitchen, lovely paint, and nice flooring. The deck was greatly appreciated for our morning coffee and enjoying the beach. A wonderfully welcoming home that provided the perfect, much sought-after "beach time". A true Outer Banks experience. Highly recommended. Location was great and overall house was satisfactory and we enjoyed our week. Esp loved the gate for our dogs, OF, nearness to stores and restaurants. The layout, location and amenities are all fantastic. The living room is very comfy for family movie night and the ceiling fan helped keep the cool air circulating. We loved the two seater high deck chairs on the back. Kitchen very well furnished. Love the gray & white paint...brightens the house. Nice vacation home, great location and view. Love the way it was decorated. Very comfortable home! We enjoyed our stay very much and are hoping to use it again next summer. Great home and location! We enjoyed our 2 weeks! The decor and updating was very nicely done and felt very appropriate for the beach, while still feeling classy but comfortable. Very nice house. We love staying here. This is our fifth time in this house. We love the upgrades and look forward to staying here again in the future. A wonderful home. You will not be disappointed. We are counting the days till our return. Beautiful home, great location. We had a wonderful vacation. The location could not get any better. This property provides everything one needs for an awesome vacation! Nice home! Loved the view. The location was perfect for us and we look forward to being in the house next year. The house was a pleasure to stay in there wasn't anything I would change!! Very nice and relaxing home. Felt comfortable. This is a wonderful house. It is walking distance to 2 great restaurants, a Rite Aid and a gas station. The outside shower is very nicely laid out. The two porches are big and seat a number of people easily on chairs and table provided with the home. The beds are very comfortable and mostly queen size.